Opened in 1914 (or 1910 according to some sources), designed by John Fairweather for the Green's chain. The exterior featured outlines of red sandstone, surrounding areas of roughcast. A glass canopy ran the entire length of the frontage. The central window feature displayed adverts for forthcoming programmes. The interior sat 1,103 (867 in the stalls, with 240 in the balcony); the screen was 21 ft by 14 ft.
After renovation in 1926, it was renamed the Cinema, the name it retained until closure in 1958. After a period on bingo, the building sat empty until it was demolished around 1973. 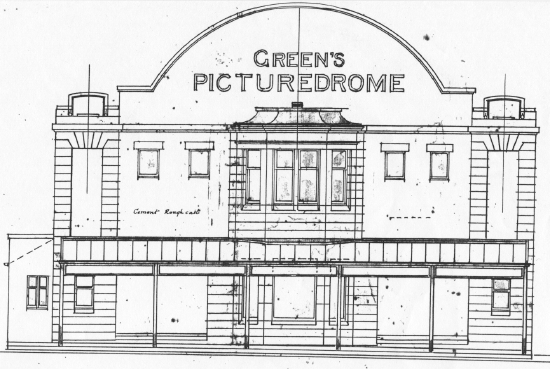 A History of Green's Cinema, Tollcross, Glasgow, Wallace H Branch, privately published, 1999.